It’s no secret that the market for online courses is big – and it’s getting bigger. Research firm GM Insights valued online learning at $165 billion in 2015. By 2023 it could exceed $240 billion. This is my complete guide to creating and selling an online course… even if you don’t have an idea for one yet. First, I’ll cover how to find a course idea and make sure it’s profitable (even if you’re not an “expert” at anything). Then, I’ll help you create your course content (even if you’re not a writer or have never been in front of a camera). Finally, I’ll show you how to promote and sell your course (even if you know nothing about marketing or sales). I’ll show you what to do in each step. I also included further resources for different steps, like a course idea worksheet in Step 2. Do you want to create an online course? Otherwise, you wouldn’t be reading this, right? So, commit to it – today. Online courses are here. And they’re here to stay. $240 billion by 2023… The question is, who’s pocketing all that money? A big chunk is going to the course creators. But how much can you really make with an online course? And yes, I run a seven-figure business selling courses, too. For example, you could easily create a course, and earn an extra $500 or $1000 a month. What would that mean to you? …but you get paid over and over again. With each and every student. Often, you can sell the same course for years. One of my training programs I created in 2014 and I’m still selling it today (after an overhaul in 2016). This was my first course… The videos were low quality. They were grainy. And I apparently couldn’t even afford a haircut. Yes, if you already have a special skill or expertise, you can “be the expert” and share that knowledge. Let’s say you’re a certified massage therapist. Or you have an MBA in real estate. Or you’re the Rock, Paper, Scissors world champion. In this case, sure – teach what you already know. Choose a topic you’re interested in. Spend a weekend or two and read the 3 top-selling books on that topic. And BOOM. You are now enough of an expert. Meaning, you’ll know more than 99% of people who are going to buy your course. Don’t believe this is possible? 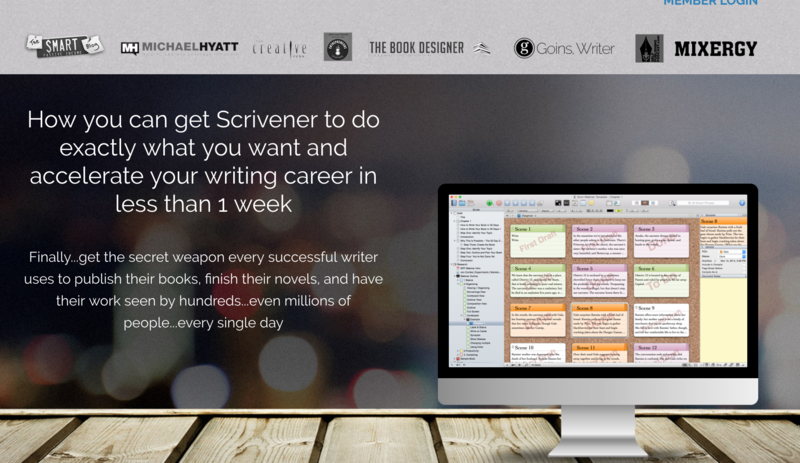 Joseph helps novelists write their novel with Scrivener. And he makes about $20,000 to $30,000 a month doing it. Let me rephrase that. He makes almost $1,000 a day by showing novelists how to use an app for writing. I was just using it casually. I definitely wasn’t an expert. I have never written a book or anything. I purchased every book on Scrivener and studied everything I could find on it. I’d study a particular feature, and then record a tutorial on it. Short 3-5 minute chunks mainly so it was easier for me to create, but it turned out to be one of the most popular features. Long story short, he created his course by learning one feature, filming a video about it. Then he learned another feature and filmed another video about it. And as you LEARN, you document the process. This way can create a course about almost anything that you’re interested in. They skip over important information because it’s too obvious to them. And what happens? The student gets left behind. That’s why a teacher who’s just one step ahead of their students can sometimes create a more valuable course. Needless to say, you should always be honest about your experience and credentials. You don’t need to be the world’s foremost expert to teach a course. The question is: What will YOU teach? Maybe it’s already clear in your mind. Or maybe you’re still looking for an idea. You can create a course about something you already know. Or you can create a course about something you’re just learning. In fact, this is the BIGGEST mistake new course creators make. They create a course, but they don’t make sure students actually want to learn about the specific topic they chose. No wonder they struggle to attract students! If someone already created the course you want to create, that’s GOOD NEWS! You might think, “But people need what I’m selling,” and maybe they do. But the internet is so large that if people need it, and are willing to buy it, there WILL be someone else selling it. As a matter of fact: if you come up with an idea for an online course, and you can’t find someone selling a course similar to what you want to offer, I’d find a new course. …and I’ll share more of those with you next. For now, I want you to know this: If there’s competition, that’s a GOOD thing. Take inventory of the things that people ALREADY ask you questions about or want your advice on. If you’re a freelancer or are already running a service business: Take inventory of the things your clients struggle with the most and ask you questions about all the time. Find the pain — and eliminate it. This means going out into the real world and finding problems that people have. Then, you can create an online course that solves those problems. People buy courses because they’ve got a problem – and they want to solve it. Maybe they’re looking to learn how to use a complicated piece of software. Maybe they don’t fit into their favorite jeans and want to lose weight. Maybe they’re stressed out and overwhelmed and want to take control of their calendar. 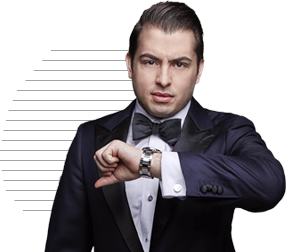 Whatever the case: people buy online courses because they have a problem in their life and they want to solve it. I know this might sound like I’m oversimplifying it, but it IS that simple. Think about the problems your friends, colleagues, and family members come to you with… LISTEN TO THEM. And then see if you can create a repeatable course that helps people solve problems JUST LIKE THAT. Sometimes it’s an acute problem that people need to solve right away. For example: How to potty train your puppy (I could have used that one…). Other times it’s a lingering problem. For example: How to be more confident. You can create a profitable course for both types of problems. But what I can tell you from my experience is this: The more specific of a problem you solve, the easier it will be to sell your course. If you’re at the point where you’re choosing an idea, I’ve got a useful worksheet for you that walks you through the steps. It’s a simple technique I use for my own courses to find a pain and eliminate it. So, make sure you grab the worksheet. It only takes 15 min. to complete. And you’ll walk away with a specific, profitable course idea. Before you spend a lot of time creating a course, let’s make sure you’re building something people will want to buy. Here’s what I mean: Instead of creating videos, worksheets, and additional resources, simply create a mini-course, and deliver it by EMAIL. You don’t need a course website. You don’t need fancy software or design. Just deliver your course in email format. The best part? If you do this, you’re not just validating your idea, you’re also building an email list of future students for your PAID course at the same time. If you want more info about creating a mini email-course, I wrote up a case study of one of my students, Guillermo, who did this with great success. What if you could sell your course before you create it? …or you can put up a “coming soon” page that explains what the course will be. Send it out to your audience or run some ads to your sales page and see if you can sell it. You can either set a start date in the future and actually sell it. Or you can create a dummy “buy now” button and simply track how many people click on it (not perfect, but it will give you an idea if your idea has potential to be a big hit). Both strategies – creating a mini email-course or pre-selling your course – are easy ways to test your idea. How do you create a course that your students will LOVE? It’s tough to create a multi-week course when you’re doing this for the first time. There’s a lot of content to create… And you want your content to be top-notch! That’s why the key to creating an amazing course content is to start with a clear outline. Don’t do that. It’s a waste of time. Especially if you’re JUST getting started. My first online course was 3 little videos and a worksheet. And yet, it helped kick off my entire business. Just 3 little videos and some worksheets. With that said, how do you decide what to cover in each lesson of your course? First, look at the problem your course solves. What are all of the steps people need to take to achieve this goal? Take a look at what dating coach Francesca Hogi (who uses Zippy Courses, my software that makes creating and selling online courses a cinch) is doing. Francesca has a mini-course about flirting. It’s only five lessons (remember: keep it small!). She breaks the topic down in logical, bite-sized lessons. First, she addresses the fear of flirting. Then she talks about how to get someone’s attention, then how to talk to them, and so on. Do you notice how each lesson brings the student one step closer to the end goal of the course? That’s exactly what you should do in your outline. After you break down your course into lesson like this, you can do the same thing for each individual lesson. DON’T pack too much content into each lesson. Seriously. For a short course, lessons should be 5-10 minutes long. Definitely don’t create lessons that are longer than 20 minutes. Otherwise students will often tune out, even if your delivery is great. What’s great is, now that you know the purpose of each lesson, creating the actual content becomes very straightforward. So, let’s look at content creation in detail in the next step. Most online courses are delivered in a VIDEO format. Plus, I always include WORKSHEETS, that help students implement what they learned. So how do you create this content? Your first online course won’t look that great, and that’s okay. You’re comparing yourself to where we are now. And that’s a mistake. You need to compare where you are now to where we were in the beginning. Remember my first course videos? But those 3 videos went on to generate six figures in revenue. Why? Because, while the videos were low quality, the content was great. But I promise you I’m not. He’s an accountant, and he teaches business owners how to understand their numbers. In his video he did just that. 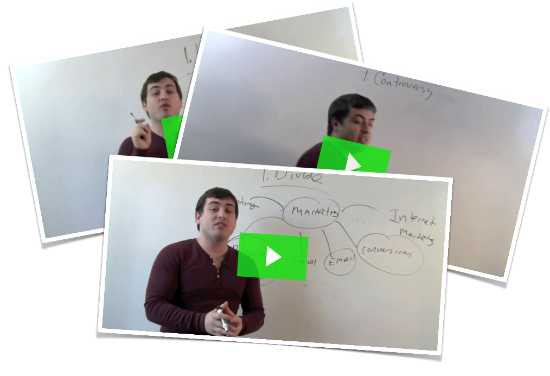 Even though it was just a silly white board resting on a chair, the content was valuable, and it helped kick off his online course business. Don’t get too hung up on production quality. Instead, focus on teaching valuable content – by giving insanely practical, step-by-step instructions – and I’ll guarantee your students will love your course. Which also means that the FORMAT of your course doesn’t matter; it could be text, audio, or video. You can either record direct-to-camera videos. 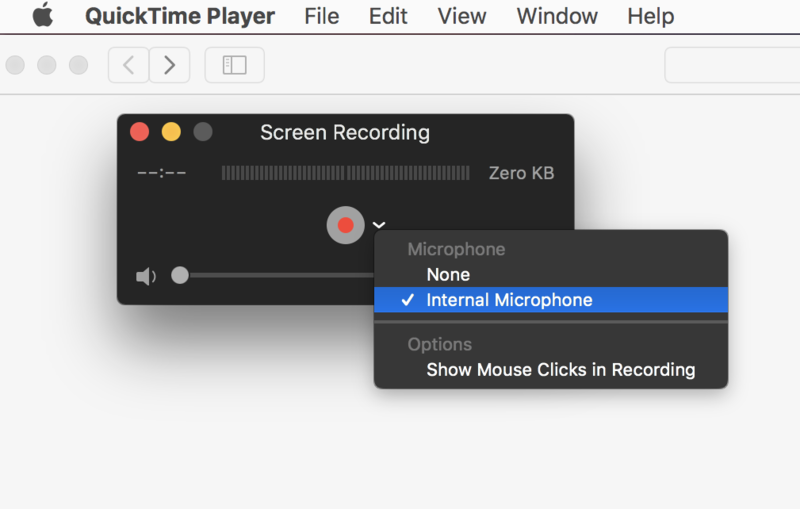 Or, you can record a video of your screen, as you go through the slides of a presentation. And you don’t need to hire a high-end videographer to shoot or edit your video lessons… You can use your phone, and there are many easy-to-use tools and software available. For screen recordings, you can try Camtasia. 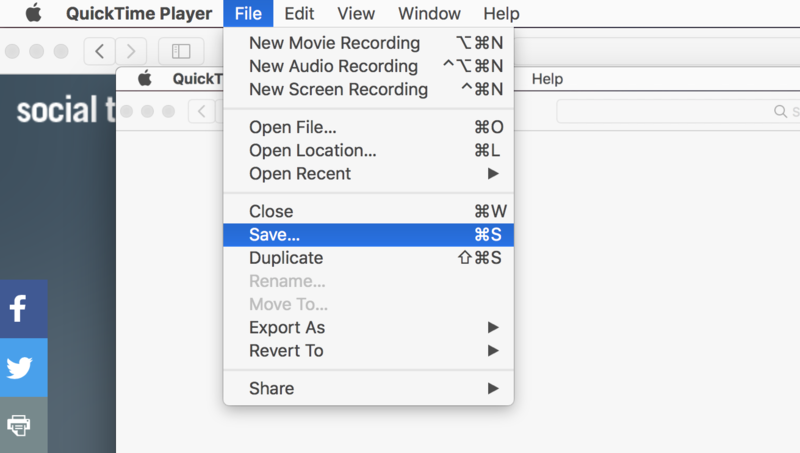 Or, if you’re on a Mac, you can even use Quicktime for free. Boom. Now you know how to make your videos. Worksheets should be PDF files, so it’s easy for people to download and print. Just create your document in Word or Pages. Then save it as a PDF and you’re done. You can make your worksheets fillable. I do this in all my courses. But you don’t have to. When you have your content… The next step is getting your course online! Time to get your course online, so you can start selling it! Zippy Courses makes creating – and selling – your course a cinch! After all, I built this software because I was frustrated with the other solutions that were available. Needless to say, my own courses run on Zippy, and I’m proud of the product we’ve built. With Zippy you can quickly and easily create your course page, protect your content, sell your course, and manage your students. As opposed to using a course platform, like Udemy or one of the many others. Personally, I just don’t like being at the mercy of one single company, when it comes to MY business. Selling and promoting your course. The first decision is: How much will you charge? People like buying courses – even when they can find the same information for free. But while people “could” find what you plan on selling elsewhere..
…they still have to find it. They also must figure out what information is legit… and what information is junk. And figuring out the difference can be a full time job for even the most savvy people. The alternative is often much easier: They find someone who created a course and they buy that. It’s what I do. And it’s what other people do too. That’s why the online course industry is exploding right now. Time is one of the most valuable things we can never get back. Why waste time “figuring out” what’s good or not when you can buy a course. And so much more. If you’ve ever joined a high-quality course, you’ve likely experienced this yourself. So don’t undercharge when you sell your own course. Think of the ideal outcome of going through your course. And then ask yourself, “What would someone have to pay to get the same results with a different method?” You can compare it to other courses, software, hiring someone to do it, or hiring a coach. With that said, don’t obsess over optimizing your price. In the beginning, just position it in the right price range. The table above should help you get started. Want more tips on pricing your courses? You should know who your students are – and have an idea where you’ll find them – BEFORE you spend a lot of time building a huge course. That’s why in steps 2 & 3 I helped you choose a profitable idea and TEST it first. However, getting students for your course is an ONGOING process. And as your audience grows, so does your course business. The BEST way to get students for your course is to get them signed up to your email list first. Why? Because email is still the easiest way to make sales online. 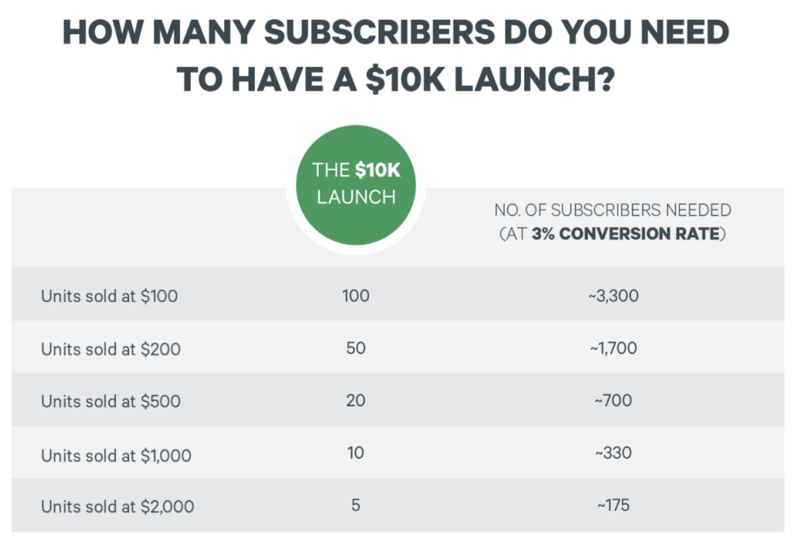 How many subscribers do you need to make $10K? Let’s say your goal is to make $10,000. If you’re selling a $100 course you’ll need to pitch it to about 3,300 people (assuming an average conversion rate of 3%). Where are you going to find 3,000 people? If that sounds like a lot, I can promise you, it’s much easier than you think. And of course, you don’t need 3,000 people. Get your first 100 subscribers. Then your first 500, 1000, and you’re already well on your way. And if you already have an email list… Great! Even if it’s just a few hundred people – heck, if it’s just a few dozen people – that’s a great start. Once you have a list of 1,000 people or so, you’re ready to launch your course. And that’s the final step! You’ve got a course. You’re building your audience. Time to sell it! Maybe “sales” sounds like a dirty word to you. Or you just might not have any experience selling anything, so you don’t know where to start… But don’t worry. I’ll share a simple 3-step pitch formula with you here. Does your course solve an “acute” problem? If people want and need a solution right away, it’s often best to sell it as evergreen. For example, a course on “How to Use Macros in Excel.” People likely need a solution NOW, so if you make them wait, you might miss out on lots of students. Or does your course address a “lingering” problem? For courses that address big, lingering problems – things that people have been thinking about for months or years – launches are great because you can build anticipation. Something like “How to Become a Morning Person” falls into this category. Remember, your course solves a specific pain or problem. So, to kick of your launch, you need to remind people of the pain they’re facing right now. Sounds negative, I know. But you need to show potential customers that you understand their problems and their struggles. By describing their pain in detail, it helps you connect with potential buyers. Now it’s time to create desire by showing the contrast between the world as it is (step 1) and the world as it could be. And that’s what you should describe in this step: describe the PLEASURE! You don’t have to mention your course yet. You can use phrases like, “Imagine if…” or “Picture a world where…” and then talk about the outcome your course delivers. Your potential customers are aware of the problem and they want to find a solution. So now it’s time to show them that you can help them. Tell them about your course, what’s covered, and how it will help them. It’s even better if you can SHOW people how it will help. For example, you could share a key insight from the course. Or share a case study from a client or student. The important point here is to create the contrast between the before and after first. Then introduce your course as the solution that will get them from pain to pleasure. When you look at sales this way, it’s not that crazy, is it? I know, we’ve covered a lot of ground. So you might want to bookmark this page. I also created a PDF of this guide. You can download the PDF version here. I know it seems self-serving right now, but it’s important: you could try and figure everything out on your own. And you may end up wasting a lot of time (and money) doing it. You could simply turn to someone who already did it, and shortcut your success by following their advice. Hi there I want to set up a piano teacher training course on line. Got the info already. Can you explain the income process and how that works please. I don’ t understand how putting up videos does that? Thanks, Jan. I have ready-to-use 300 technical lessons. Where should they be hosted ? I want to create a course teaching Brazilian Portuguese to English speakers. Do you think it can be a good idea? I would like to do an online course to share my ideas to friends and followers and many others who are really having the interest to learn a new different way . so I’m getting my self organized to let help me lunch my course online . derek, thank you! I have already created a language course and now i need to put the videos and pdfs up online and sell it….can you give us some direction about what platforms to use to host the course? Should i use a course builder by someone else? custom create a website? and for paid courses, how do you keep multiple people from downloading or viewing what one person paid for (sharing)? I appreciate your guidance. You should use a plugin on a wp site like Learnpress if you are just getting started or Zippy courses by derek. The videos can be hosted on vimeo and the plugin will take care of the rest. Just put in the content and you are good to go. I am too preparing my first video course. I’m deep in the course creation process right now writing a big course to help paramedics pass a professional certification exam. I’m on a time crunch because I’ve already Pre-Sold the course to “test the waters.” I wish I had thought to create a small course first to get my feet wet before jumping into such a large undertaking. Too late now. Thanks so much for this post! I am just starting my own blog as a way to sell my e-courses (my first one is going to launch at the beginning of February!). You have definitely inspired me to keep going with the e-courses and on making more in the future. Thanks! What an inspiring article! Thanks for sharing these tips – especially #1. One of the most discouraging things is seeing your ideas already taken. However, if you can do it better, different, cheaper, or for a unique audience, I guess it doesn’t hurt to create a course on a topic that’s already popular. Appreciate you sharing your knowledge! Hey Derek, great article. I especially appreciate you emphasizing starting small. The first step is to create SOMETHING – a short course using basic authoring tools focusing on an area of knowledge you know something about. Waiting until you’re the Expert of Experts and have a professional production studio and a team of Instructional Designers ready to help create your 16 hours masterclass is a great way to never get anything done. Great article! Finally, I was able to find an article that answered most of my questions in a clear and simple manner. Brilliant article with detailed guide and helpful information! But I am sure that 7 is not the final number when it comes to the tips of creating powerful on-line courses. Besides all your listed notes above, I would like to contribute one more tip that helps create a successful on-line course without any struggle. You can purchase a theme that is integrated with powerful course plugin and is suitable for your website. I can recommend one from the latest release theme listing on ThemeForest which is Lincoln WordPress Theme – amazing theme using latest Material Design. I have purchased this and it totally surpassed my expectations, given me the feeling of satisfaction and bring in a full-fledged website with amazing course listing and course detail page design. There are many WordPress on ThemeForest can do this. You guys should give it a try! Staying with the subject of improving as you grow …. I would love zippy courses but can’t afford it yet. Do you have a free version or can you recommend a free one I can start with? I hate the idea of changing later but I have to start somewhere right? I want to sell an online course, I know my subject…now what? Mahalo nui! Don’t need to sell a course, need to sell a product! I too agree with Ron Steward. Even though we have ideas and resources, getting customers from online is very hard. As mentioned here, it is easy to find ideas for creating compelling contents and courses. Even if we don’t have resources to create them, there are a lot of free and paid tools to get the job done. Here at Toronto, one of my friend had created a platform to create free courses for high school students. It has amazing features like webinar creation tools and social login. The LMS he used was Skyprep and everything had set up within few weeks. But he is still searching for users. This is amazing what you have said.But problem is that even if we have a lot of ideas and creative methods and tips with which other people can get benefit.We are unable to launch something free of cost.People are worried to spend a lot on internet and get nothing.People are interested in something where they can take a free start and start making money and then go further.Your words of wisdom are appreciated and we surely want to try it,what you are saying. Hi Ron. You CAN start for free. 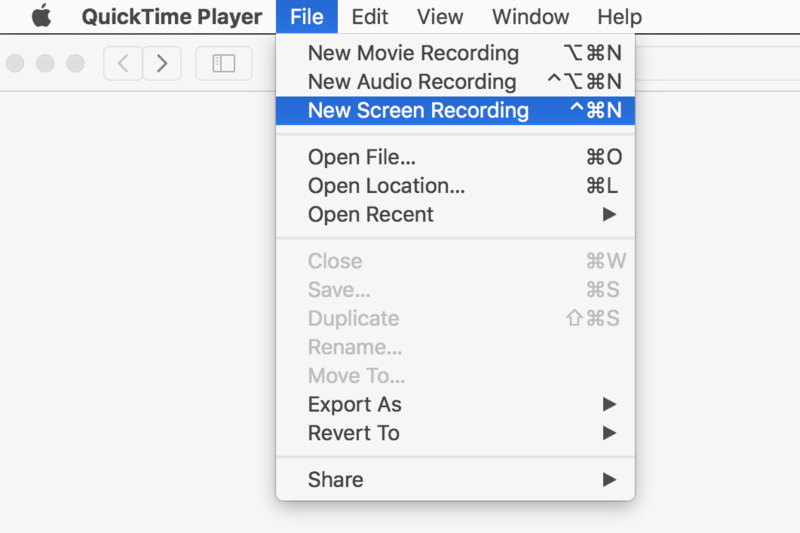 Use your phone to record the videos, screen casting software if you want to record a demo, and use an open platform like Udemy. These are free to use and test out your content. Good luck with creating your first course! The world needs what you have to teach! I believe everyone was born to teach something. There’s no better time to learn and teach online than there is today. I never received a confirmation email. I am on an iPhone and I have multiple email addresses with no problem with receiving email messages on any of them. Based on the previous comments in this thread it looks like you may have a systematic problem in your auto responder. Looking forward to getting more info on your Zippy Courses. I love what you say, but I am still a little dense about understanding how to monetize any video online courses that I create. Can you enlighten me? Is it the number of hits on the video on you tube that generates advertising from where you get revenue? Or how do you put up a video in public for publicity purposes, and then expect them to pay for the course? Sorry to sound so naive,…but well, here I am. Ok I have a question. Btw, I am brand new to the online business arena. I have two ideas for online courses. I cannot find any courses that are currently being sold online that offers the same content. However there are a lot of “how to” articles available on websites like Forbes and Entrepreneuer that cover the same content. They do not have much depth and they are quite vague. Since articles are being written on the subject matter does that mean there is enough demand? Out of curiosity, how much did you charge for your first 3-video course? I’m in the planning stages for numerous exciting wellness courses focused on yoga, nutrition, and self-cultivation and I’m having trouble figuring out the price-range for these products. I already have an introductory wellness course for sale on my website, in addition to a free 5 week course, but I haven’t been able to achieve the sales I hope for. Hey Derek thank you for another outstanding blog post! This is really exciting news to know that there is huge potential for online courses in 2015. I’ve always thought that online courses were something created by gurus, high level influencers, people with money, or other high ranking experts. I would have never thought that “everyday” people could create an online course and make six figures. Like many others, I was always taught that if you really want to be successful, you have to go to school, get good grades, find a great job with benefits (including retirement), don’t take too many risks, and let your employer or government take care of you for life. When I read books like Kiyosaki’s “Rich Dad Poor Dad” and blogs like this one, I realize how much I’ve been brainwashed. I now fully acknowledge the potential to make money with online courses and other forms of making money online. After all, it’s all about providing genuine value. Thanks again Derek for this very encouraging post! I’m creating a new online course for performers and entertainers, and this time I’m having someone else film and edit the videos. You should sign up for the free series for sure. Too good to say no, I’m in. Lets do the email course. See you all there! I have been thinking about creating my own internet marketing course for my blog recently … and look, you just shared awesome tips on this topic!! This was a great read! .. thanks again, for the value, Derek! Always love to read your stuff but here’s a question/problem that I’m experiencing: I’ve produced online courses, blogs, etc, only to find my material re-published on the web, word for word, without so much as a back link, by-line or even honorable mention! It’s annoying to say the least! To put your heart and soul into a project only to have other people steal it! It’s gotten so bad that I’m leery about blogging or producing anything of value online because it’s too easy to steal! Any advice you might share would be most appreciated. This happens, and you shouldn’t let it affect you. This is one reason why you need to protect your content with a plugin like ZippyCourses. Very weird Ben. When you subscribe, make sure you add news@socialtriggers.com to your whitelist. It may be getting blocked by your email provider. I cannot say how grateful I am to you and Zippy Courses Derek. Thanks! The comments didn’t work in FF, had to use Chrome. Also, no confirmation email came through after signing up to your course. Instead I got the first of the 5 emails. Thanks for that Gabi. We are working on that right now. The new design just went live, and we’re still ironing out all the kinks. This post could not have come at a better time since I’ve just started planning my first online course and I was a little nervous about how it’ll turn out. Also no confirmation email received. Not in Junk folder either. Hey Bronwyn, what email service provider do you use? We use an industry leading email delivery service – and if it’s not getting threw, we suggest you add news@socialtriggers.com to your whitelist. Signed up for your email series, but no confirmation came through to my gmail inbox. Not in spam either. Nothing. You got that probably because you were already on my email list – and confirmed. So, instead of confirming again, we just sent you the series as promised. Been tempted to try out ZippyCourses but I’ve been having the best luck using Udemy. They promoted one of my courses back in November last year and I made $1000 without doing anything but the “creation” of the course, It took me a day to record the videos and another day to write the content. Not bad for a course I created in a couple days! I’d be interested in learning promotional tactics to take advantage of loading up a course onto my own site, I think more than anything getting buyers to your course is the biggest challenge. P.S. your comment form is not working for me on Firefox, had to use Chrome. John. Now that you have social proof, lots of students, and great ratings, this is the perfect time to bring the course over to your own website and start your own marketing. You can get a lot of visibility on Facebook for $5 or less per day! And you can start to experiment with raising prices a little and keep all the profit instead of splitting it with Udemy. I like Udemy and I think it’s a great place to start and use a strategy like this when you’re first building your list and credibility as an instructor. Time to branch out on your own! Sounds like a great business strategy. Hoping someone will promote something for you ;-). I know you’ve been a reader here for a while. Promoting the course is something that’s a whole different story, but we’ve covered that a lot here. Check again, it should be there. I do have a question that is related to your previous post as well. As we learned earlier, testimonials are extremely important. But how to launch a brand new (first) online course when I have zero testimonials? Is this something I should not worry about and just reach out to the first buyers for instance? Or just give my course for free to some people and ask an honest testimonial for return and then launch the course? I cannot wait to learn everything from you and I am definitely going to join your class as well.